On our last full day in Telluride, Steve once again declined to join Eric, Leroy and I for a hike as we headed out of town on foot for the Liberty Bell Basin Trail on the north side of town. I had in mind a couple of 13ers on the high ridgeline separating the San Miguel River and Sneffles Creek drainages. Though named, Mendota is not a ranked summit with less than 300ft of prominence while T5 sports more than 400ft. Eric had little interest in hiking the trail up to the crest but planned to turn around with Leroy after he'd had enough. We started by hiking up Tomboy Rd, a 4WD/OHV road that connects Telluride with Ouray over Imogene Pass. It is very popular with Jeep owners, Jeep rentals (available in both Telluride and Ouray) and touring vehicles that carry half a dozen paying passengers or more. One of the latter passed us shortly after we started out, but luckily our route would take us less than a mile up the road until we found our turnoff. The Jud Wiebe Trail is one of the easier ones found around town, making a small loop of a few miles without going too high (the adjacent Sneffels Highline Trail is excellent if you want a maintained trail going high on the north side of town). After some short switchbacks brought us higher we reached the junction with the Liberty Bell Basin Trail and turned off here. The trail climbs higher up the east side of Cornel Creek, reaching an old mining settlement after a few miles. We stopped to check out some old cabins that had been erected here in the 1880s during Telluride's heyday as a mining town. Gold had been found at the nearby Liberty Bell Mine along with traces of other minerals. All of the frenetic activity had ceased more than 100yrs ago, leaving the cabins to slowly decay back into the earth. Continuing higher on the trail, we were surprised to see a large herd of several hundred elk moving down the slopes. We thought it might have been us they were descending to avoid, but later I found there was a trail runner just above us that had spooked them first. Wary of people, they would rather search out less-populated slopes though we were greatly outnumbered and posed no real threat. Undoubtedly, hunting season keeps the herd from becoming more habituated to people. Shortly after the elk migration, Eric and Leroy turned back while I continued uphill. I met up with the aforementioned trail runner at the junction with the Sheridan Crosscut Trail, my planned return route. Above this point the trees thin out, leaving open, green alpine meadows which in turn give way to talus, sand and rock. The weather was heavily overcast and threatening some rain, but luckily the cloud ceiling stayed above the summits for the most part and the rain held off. Going over a notch south of Mendota, I was passed by a group of four ladies heading in the opposite direction. This notch separates Liberty Bell and Marshall Basins, the latter a site of much more extensive mining. The trail traverses high across Marshall Basin and continues to the main crest over a saddle between Mendota and T5. A forged metal sign attached to the rock describes this as Krogers Canteen. Later I learned that the entire portion of trail I had utilized out of Telluride is part of the Hardrock 100 ultra that takes place each year. Also known as Virginius Pass, Krogers Canteen is the highest of 13 aid stations in this 100-mile race. Famously, tequilla shots are made available along with the usual food and drink selections for such an event. No sign of runners today, nor any tequilla for that matter, but there are fine views looking south from the pass as well as north into Governor Basin. I left the trail here to gain the ridge heading west to Mendota. There was some sketchy class 3 on loose rock to reach the ridgeline after which it becomes a very tame hike the remainder of the 1/3mi distance to Mendota. Some old, splintered utility poles are found along the ridge along with much steel cable, possibly used for a mining tram line running over the crest. 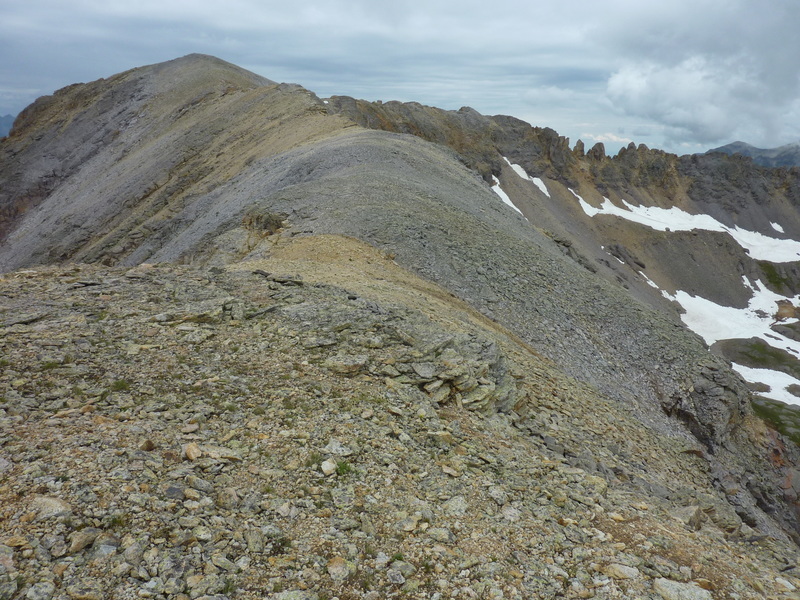 After reaching Mendota's summit, marked by a small cairn and rusting steel pipe, I returned back to Virginius Pass and then continued east to T5. Clouds were lowering and threatening more, but the route to T5 was much easier without the crappy class 3 noted on the west side of the pass. A small register was found in a glass jar but did not date back far at all. It was not yet 12:30p when I left T5 after snapping a few hasty pictures in the diminishing visibility. Light rain began to fall as I made my way back to the pass once again but let up as I started back down the trail.